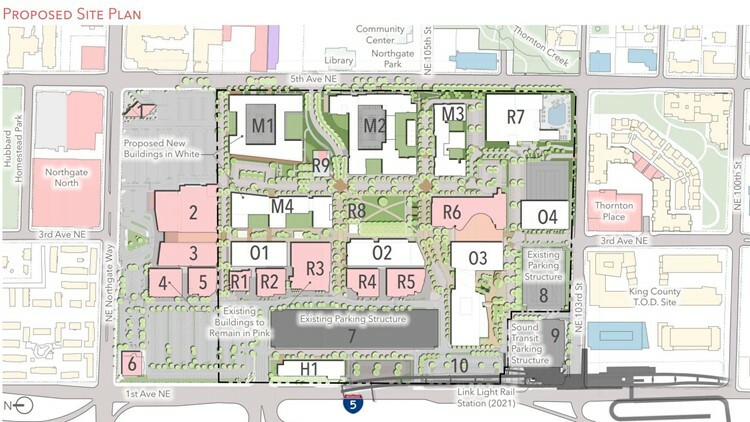 Documents details plan to add a "Central Park" and at least one hotel in addition to 1,200 new housing units to the current site of the Northgate Mall. New documents show the owner of the Northgate Mall has plans to tear a majority of it down and replace it with multiple residential and office towers. It is a radical transformation of the spot, known for years as one of the country’s first enclosed malls, and presents a new vision of the sprawling 55-acre site. Simon Property Group first pitched the idea in March, but the documents filed earlier this month show its new plans to create a "Central Park" and at least one hotel in addition to 1,200 new housing units at the site adjacent to a light rail station planned to open in 2021. Simon’s filing is part of Seattle's Early Design Guidance for the property, for the Major Phased Development and Master Use Permits. The hundreds of pages lay out in great detail the company’s preferred design, which includes tearing down 60 percent of the mall for the massive privately financed redevelopment. It encompasses the area between 5th Avenue Northeast, Northeast 103rd Street, Northeast Northgate Way, and 1st Avenue Northeast. That includes a three-phased redevelopment of the site. Simon said it would like to build four new six or seven-story residential towers, making up more than 1.5 million square feet. The proposal also calls for four additional mixed-use office towers, with 768,000 square feet of space, a three-story indoor fitness center with rooftop pool, and an additional seven-story 200-room hotel connected to the light rail station. All of the construction would be centered around a park, which would act as a gathering point in the new redevelopment. Simon’s documents also call for new landscaping, tree planting, a hill climb, and the more than 100,000 square-foot park. 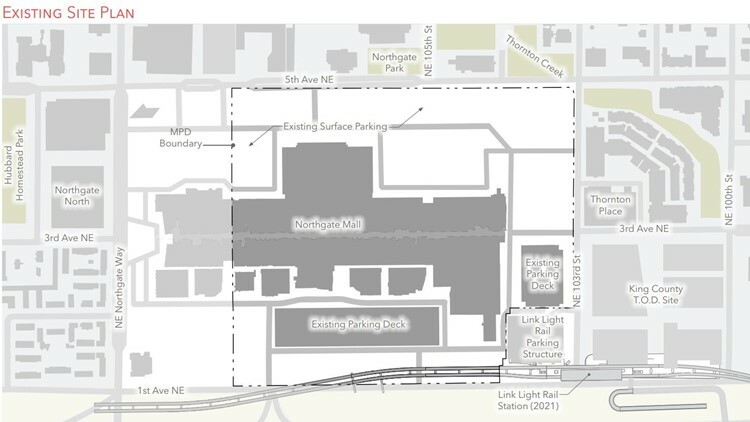 The plan is a dramatic “revisioning” of Northgate Mall, which would once again be tied to transportation. 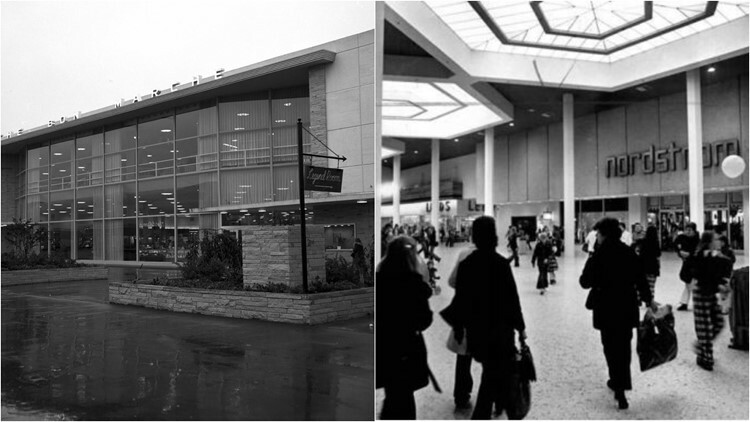 The mall opened in 1950, at a time when the country was adapting to the automobile and malls were few and far between. Now, with light rail coming on track, the space would adapt again. Northgate Mall was one of the first enclosed malls in the United States. City leaders have been pushing for this kind of transit-oriented development for years, and the project has the potential to serve as a model going forward if permits are granted. "We have a major focus on connectivity and opening the spaces to include a truly multi-modal transformation versus the nearly 70-years of primarily automobile focus," wrote Simon Property Group in an email to KING 5. There may also be an indicator of retail in the age of Amazon. Simon’s documents said it is still confident in brick and mortar companies. "Brick and mortar shopping still accounts for 90 percent of all retail sales, and as a result, well-positioned properties continue to thrive. 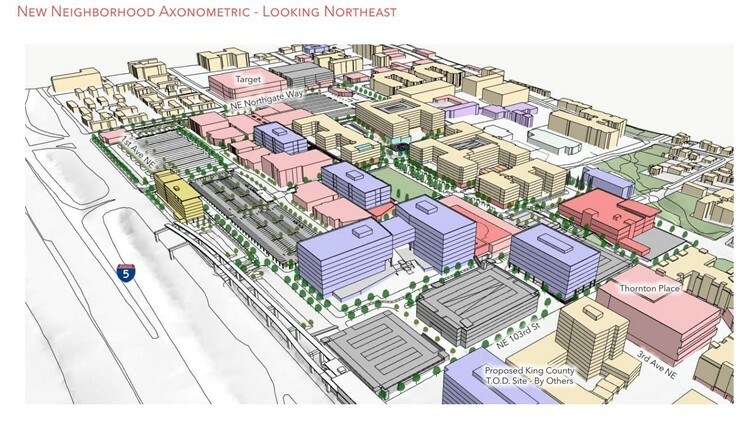 By transforming Northgate Mall into a dynamic, mixed-use development with a vibrant live, work, play atmosphere, Simon is helping to ensure that the rapidly growing North Seattle community has a central hub which is resilient to industry changes and retail tenant turnover," the documents read. Seattle City Councilmember Debora Juarez, who represents District 5 in North Seattle, seemed thrilled by the filings. "This project is just one of many opportunities for density and transit-oriented development in District 5 and in the Northgate Urban Center. Simon Partners is sitting on some of the most valuable land in all of North Seattle, and I am excited to see them looking at redeveloping the mall and a mostly surface level parking lot into a mix of housing, commercial, office and green space, all within close proximity to the future light rail line," said Juarez. "Simon Partners has been a good example of a private entity working with the government to create a development that considers the community’s needs. I am deeply committed to leveraging this transit-oriented development to create new opportunity, increase health and wellness and fight displacement in District 5. I look forward to a great partnership with Simon Partners and continued conversations around community needs such as a pre-school and early childhood center, a grocery store and reconsidering supporting affordable housing development through MHA," Juarez continued. If permits are granted, it could take 15 years for the entire vision to be carried out, according to the company, and allow flexibility with existing leases. The north side of the mall, untouched by the renovation, includes leases that extend for 10-15 years and will be re-evaluated later, according to Simon, which did not disclose the overall potential cost of the project. A public hearing on Simon’s proposal is scheduled for Monday, Aug. 13 at 6:30 p.m. at Seattle’s Good Shepherd Center, 4649 Sunnyside Avenue North, Room 202. There will be another public hearing on Aug. 27.